Stock markets around the world tumbled last week over concerns about a possible trade war between the US and China. 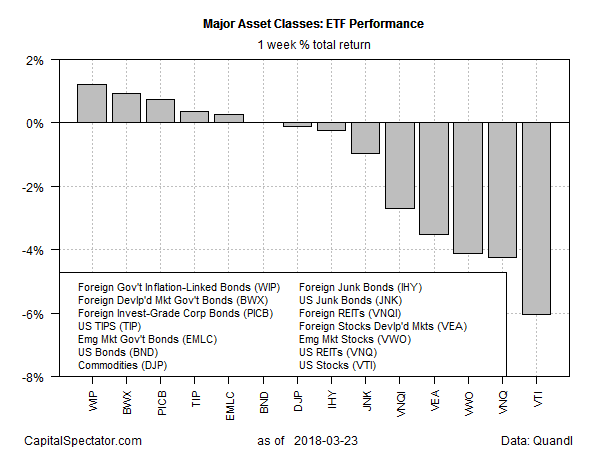 The risk-off posture generated renewed demand for bonds, particularly foreign bonds, which delivered the only gains last week for the major asset classes, based on a set of exchange-traded products. Supported by a weak greenback, foreign inflation-indexed government bonds in US-dollar terms posted the strongest advance for the five trading days through Friday, Mar. 23. SPDR Citi International Government Inflation-Protected Bond (WIP) jumped 1.2% — its first weekly rise since mid-February. Global equity markets, on the other hand, fell sharply last week, led by a hefty loss in US stocks. Vanguard Total Stock Market (VTI) declined 5.7% — the fund’s biggest weekly decline in over two years. Despite last week’s market volatility, a generally positive one-year trend prevails for most of the major asset classes. Notably, stocks in emerging markets are still on top, posting the strongest year-over-year gain. Vanguard FTSE Emerging Markets (VWO) was up 17.0% over the 12 months through Friday. Meanwhile, the lone loser for the one-year is still US real estate investment trusts (REITs). 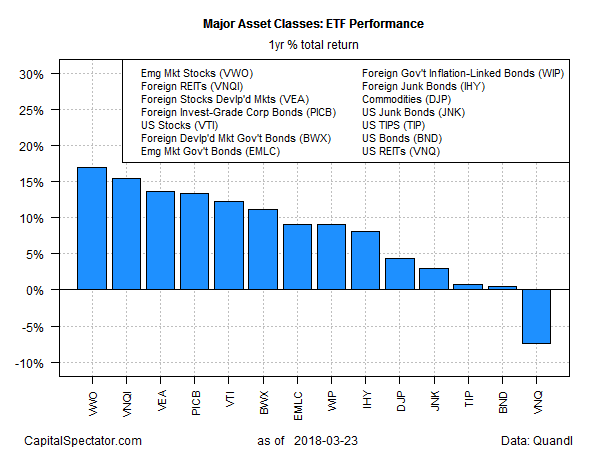 Vanguard Real Estate (VNQ) is down 7.4%, the only case of red ink for annual performances among the major asset classes. Using current drawdown as a risk guide continues to show that broadly defined commodities are still posting the biggest peak-to-trough slide for the major asset classes. 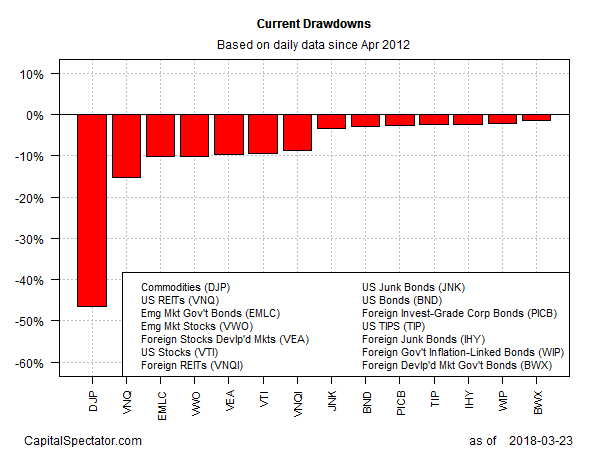 The drawdown for iPath Bloomberg Commodity (DJP) at last week’s close was more than -46%. Meanwhile, foreign government bonds in developed markets via SPDR Bloomberg Barclays International Treasury Bond (BWX) posts the smallest drawdown at the moment at just -1.3%.